Unfortunately, a solid resume with a track record of sales success is no guarantee that a candidate will succeed for you, in your unique sales environment. Employers looking to hire the best salespeople for their team back up their gut feelings with a validated sales assessment test. But not every assessment tool on the market has the ability to accurately measure a candidate’s personality traits, motivators, and competencies. TriMetrix is more than a personality assessment. It’s an intelligent, 3-science system that allows employers to identify the specific competencies a sales position requires for success. From here, you can objectively compare candidates and identify the one with the necessary strengths, and traits, Traits, and who is also a good fit for your culture. What Makes TriMetrix Different From Other Pre-Employment Assessments? 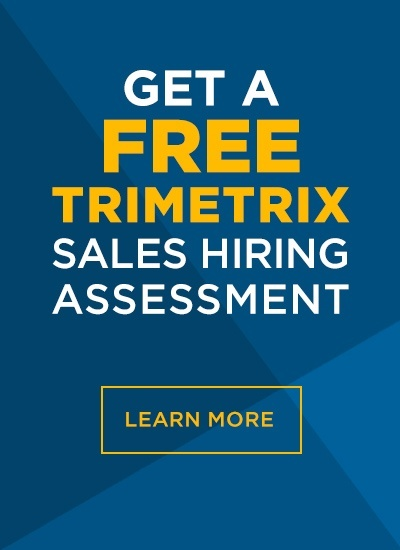 Most sales aptitude tests used for hiring only measure one dimension of a salesperson.TriMetrix combines three assessments into one system, giving a more complete picture of someone’s strength and challenge areas. TriMetrix gives you the most accurate prediction of how a salesperson will perform on the job by filling in gaps that other pre-employment testing often misses. The TriMetrix has been a fantastic addition to our talent management toolkit. It has helped us identify, hire, and retain salespeople and sales managers that are a much better fit for our culture. The cool thing about TriMetrix is that it’s not just a hiring tool. It also provides us with powerful info that helps our managers coach and mentor reps by providing insights into how to use the motivators, personal skills, and behaviors the reps bring to the job to help them be more successful. TriMetrix can be used to find, hire, and coach people for any position, within any industry. An additional test, the Selling Skills Index, is automatically integrated if you’re assessing a sales candidate, or the salespeople you already have on your team. The assessment system can be used throughout the entire employee lifecycle from selection, to onboarding and coaching, to succession planning. Don’t leave your hiring decisions to gut feelings. Create a blueprint for high performance and let TriMetrix find the perfect match.